with a Side Trip to San Diego before! 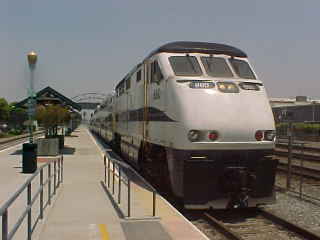 Metrolink started running midday Orange County-Inland Empire service during the last school year while I worked at McFadden Intermediate. With all my weekday holidays booked with other trips, I never got a chance to ride it until now. I was going to leave today for a trip from Tijuana to Tecate but it got canceled yesterday so with a day free, I decided June 23rd would be the day. Checking the Metrolink schedule, I could squeeze in a round trip to San Diego before catching Train 852 at 11:32 AM. This train set would be following us up from Oceanside. When Train 562 pulled into Santa Ana, I noticed it had Coaster unit 3002 working on the rear of our train. This would be just a normal run of Surfliner 562. We passed Metrolink 683 at Tustin and 607 above Laguna Niguel/Mission Viejo. Later we held the mainline at CP Serra to meet Surfliner 763. After we passed CP Songs, we zoomed by Metrolink 850. 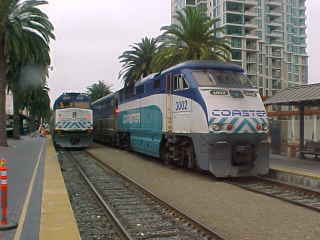 At Oceanside, we went into the siding to meet Surfliner 565. 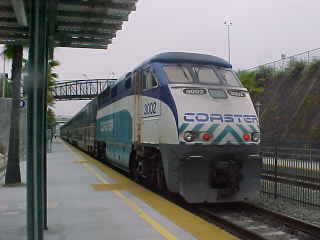 At Solana Beach, we waited for Coaster 633 and I walked to the rear for a picture of the Coaster 3002 on our train this morning. Later at Sorrento Valley, we held the mainline for Surfliner 567. Surfliner 562 then climbed Miramar Hill before rolling down Rose Canyon. Our train arrived in San Diego early. The rear end of 562 alongside of Coaster 635. I walked to the front end of our train. 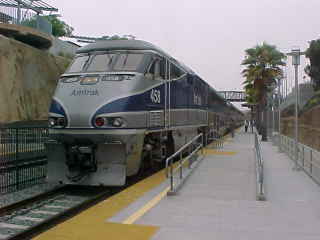 Surfliner 562 and the rear end of Coaster 635. 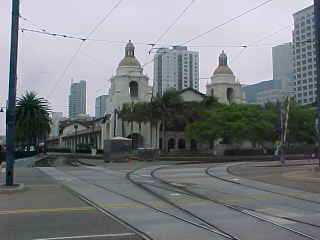 I walked across Broadway for a picture of the Santa Fe Station. Coaster 3002 was set out and shared the station tracks with Coach/Cafe 6303 which had been removed from Surfliner 567 the day before because of a major truck spring problem. After that, I went into the station for more Coca-Cola and walked back out to my next train. 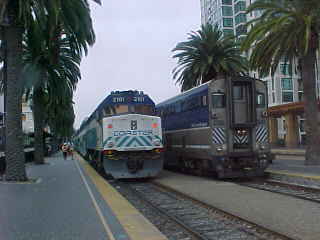 Our train was now ready to return north to Goleta alongside Coaster 635 which would follow us north to Oceanside. We left San Diego on time, met Coaster 640 above Elvira and below Cumbres, met Surfliner 564. 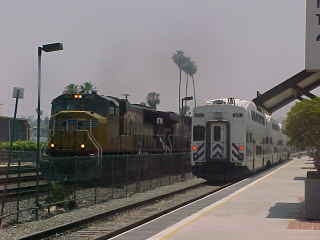 At Escondido Junction, we met Metrolink 600 from Los Angeles. 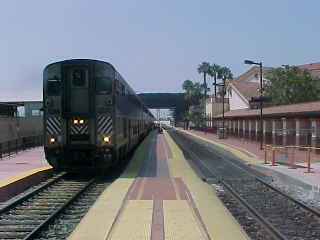 At Oceanside, this train would become Metrolink 852 going to Riverside. 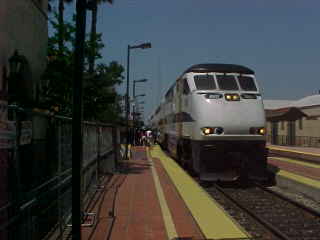 Metrolink 852 would follow us north and I would board it at Santa Ana. We met Surfliner 566 at CP Oneil before we ran alongside the surf through San Clemente with the sun trying to peek through the clouds. By San Juan Capistrano, we were in bright sunlight. 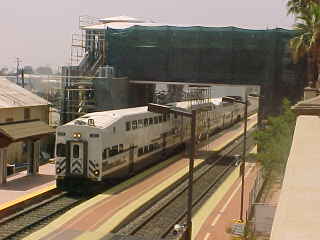 Surfliner 748 was passed under Interstate 5 in Mission Viejo. Santa Fe GP50 160 was on a rail train at CP Bake in the siding before we arrived at Irvine. 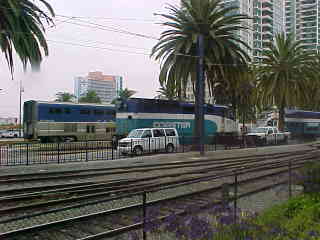 At Santa Ana, I detrained for a picture of our train and I bought my Metrolink ticket for Riverside just as Surfliner 769 left. 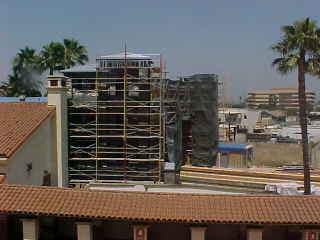 I went up to the north balcony to wait for a picture of Metrolink 852 arriving in Santa Ana amidst the construction taking place. As the train arrived, I ran down the stairs and out to the platform to board this train. We could only get on through a single open door in the Cab Car. This train, running in push mode, had Cab Car 621, Coaches 101 and 160 and engine 880. We ran to Orange where we waited at CP Maple for Metrolink 851 to come off the Olive Line. We had to "flag" the Taft Avenue grade crossing due to a broken crossing gate before our train ran to Anaheim Canyon. At Atwood, we curved onto the BNSF mainline to Riverside. We passed a westbound BNSF freight just east of Atwood. At the new holding siding east of Imperial Highway were cars from a stack train. Just east of the Horseshoe Bend there was another cut of stack cars on the north main. At West Corona we met Metrolink 811 which was on the south main in the station. 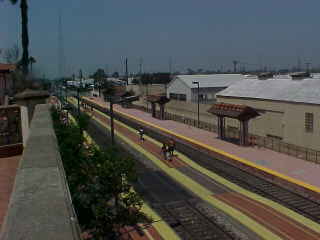 The train continued on to North Main Corona and then Riverside-La Sierra station. I asked about the ridership on these midday trains and was given the answer of low. From what I saw today that is correct. I will say though, that these Metrolink trains will beat the traffic and stress on the 91 Riverside Freeway. We arrived at the Riverside Downtown station on the north platform five minutes early. I stepped off into the midday heat of Riverside for a post arrival picture. 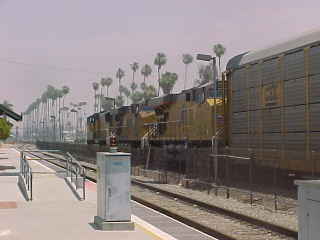 At the same time, an eastbound Union Pacific freight rolled through Riverside. Contrary to what the timetable stated, our return train left from the north platform instead of the south platform. I retreated back into the nice cool air of Coach 160 for the trip home. Our train had to wait for an eastbound BNSF freight before we could depart Riverside. It was a relaxing trip back to Santa Ana with me listening to "The Best of Poison 20 Years of Rock!" 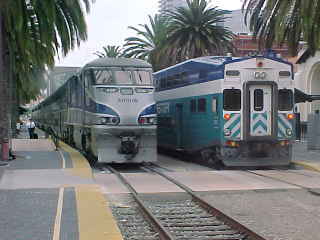 At West Corona we met Metrolink 704, a Los Angeles to Riverside 91 Line train. The BNSF was quiet on the way back to Atwood where we turned southwest to Anaheim, then Orange, before arriving in Santa Ana. 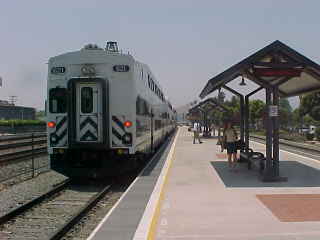 Metrolink Train 853 at Santa Ana. View of the construction progress on our new east platform. View of the west tower showing the progress there. I drove home and relaxed the rest of the day.